Product #60568 | SKU TAM-C01 | 0.0 (no ratings yet) Thanks for your rating! The Tilta Shock-Absorbing Arm provides the ultimate experience in vehicular stabilization. The front arm is a hydraulic damping support system. Using two hydraulic cylinders, it can get ultra smooth shots even when stressed to its maximum payload capacity: 25kg! The Tilta Shock Absorbing Arm was engineered for high speeds. The faster you go, the more the arm will provide enhanced resistance, peak shock absorption, and stability. The built-in damping adjustment knob can be used to fine tune your rig for optimal calibration. The main car mount of the arm insulates the “after-shock” that can stem from the mounting equipment itself. Simply use one 3.8cm speed rail (5cm outer diameter) to connect it to any vehicle car mount rig, making it a highly flexible system to get a variety of car-mounted shots. The Tilta Shock Absorbing Arm can handle various shooting environments via the main arm’s shock absorbing spring with built-in tension adjustment from 10 to 25kg. The stainless steel shock absorbing cradle head is resistant to high temperatures and corrosion. Additionally, the cradle head provides hard damping adjustment knobs for side-to-side and back-to-front movement in order to sustain excessive shock from a fast-moving vehicle or uneven terrain. 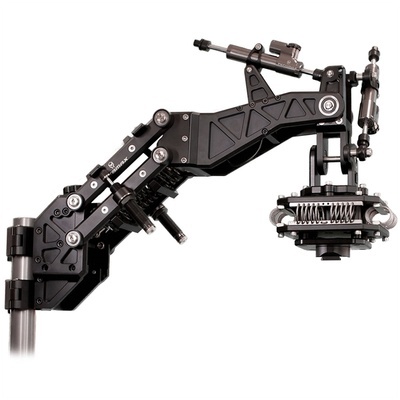 The arm was built for the Tiltamax Gravity 3-Axis Gimbal. The cradle head is equipped with Tilta’s signature Tilta Gravity Adapter Mount. Quickly and easily slide the Gravity onto the arm and you are ready to go! The kit also includes Movi and Ronin 2 adapter mounts. The Tilta Shock Absorbing Arm comes complete with a rolling hard shell waterproof safety case with custom foam inserts. Combined with Tilta’s other filmmaking accessories like the Nucleus Series Wireless Follow Focus Systems and Wireless HD Video Transmission Systems as well as 1A Tools’ Alpha Wheels, and, you’ll be an unstoppable filmmaking machine!